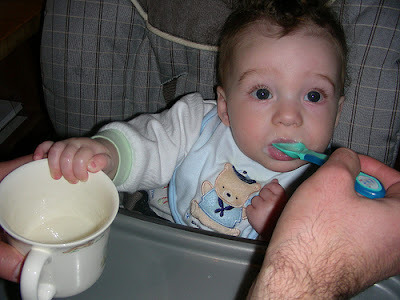 Parenting parent parenting parent: What’s your child eating? Meeting your child’s daily nutritional needs. WHAT exactly is a healthy diet? It is one that has variety and balance. This is important because various foods provide different nutrients and in different amounts, and your child needs them to grow and develop healthily. The principle of variety and balance can be seen in the Food Guide Pyramid – the essential reference for a healthy diet for young children between two and six years old. Let’s start from the base of the pyramid – carbohydrates. These foods are good sources of energy and should make up the bulk of your child’s diet. Filling, nutritious and yet low in fat, many carbohydrate foods also provide fibre, minerals and vitamins. The following are some examples of one serving of carbohydrate foods: 1 cup of porridge; ½ a chapatti; ½ cup of cooked rice; ½ cup of noodles; 1 slice of bread. Do vary the types of carbohydrate foods your child gets. Let half of your child’s total carbohydrate intake come from whole grain cereal and cereal products as they are high in fibre. Do not assume that carbohydrate foods are rich in fibre just because they are brown in colour. If your child refuses to eat whole grain foods, try combining with non-whole grain alternatives. Pair a slice of ordinary white bread with a slice of whole grain bread to make a sandwich. Mix white and brown rice. Move one level up the Food Guide Pyramid and you have vegetables and fruits. These provide the vitamins and minerals required to build a strong immune system and ensure overall well-being. Offer your child vegetables and fruits, the more colourful the better! Dark green (leafy vegetables), light green (pears), orange (carrots), red (tomatoes), yellow (bananas) ? let your child enjoy them all. Fruits are best eaten fresh and whole. If you decide to give your child fruit juice, make sure it is fresh with no added sugar. Limit your child’s intake of packaged juices and fruit drinks that are high in sugar. Many parents find that children are more receptive to fruits than vegetables. However, it is important that you give both fruits and vegetables as you cannot substitute one for the other. Fish, lean meat, poultry, egg, beans and other bean products are good sources of protein. Many of these foods are also rich in iron, a mineral that your child needs to obtain from his diet as his iron reserves have started to deplete since he stopped breastfeeding. Examples of one serving include 1 medium-sized chicken drumstick; 1 cup of beans; 2 matchbox-sized pieces of lean meat. However, excess protein is converted to fat and stored in the body, so give protein-rich foods in moderation. Go for lean or low-fat meat. Serve it baked, broiled or grilled instead of fried, and always discard the skin. Your child should receive protein from animal and plant sources. Include beans, bean products and pulses in your child’s food. Milk and dairy products are to be taken moderately. They are excellent sources of calcium and are also good sources of protein, vitamins and minerals. Examples of one serving include 1 cup of milk; 1 cup of yoghurt; or 1 slice of cheese. Your child needs fats for physical and mental development, so go for full cream milk. Avoid sweetened condensed milk and evaporated milk which have low nutritional value. The Food Guide Pyramid doesn’t state serving sizes for “fats, oils, sweets and salt” because consumption should be kept to a minimum. So watch your child’s intake of fats and oils as excess can lead to being overweight and other health problems. Sugar-laden foods are high in calories and most tend to be low in nutrients, so limit your child’s intake. Salt is required in small amounts and excess is unhealthy. Try not to add salt to foods. Avoid processed meats (for example, sausages and luncheon meats), and salty snack foods (for example, chips).